The University of Melbourne announced on Friday a new technology they are calling “GiFi”, which promises some serious game-changing wireless transfer speeds for all types of consumer gadgets. 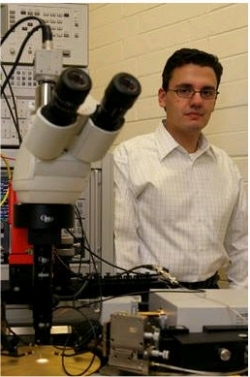 The tiny silicon chip invented by professor Stan Skafidas is able to move data through the air as fast as 5 gigabits per second at a distance of just over 30 feet. This short-range wireless technology would potentially be a competitor or more than likely a replacement for WiFi, and things like Bluetooth might want to look out as well. The transfer speeds combined with the constantly increased storage capacities of small handheld devices could really take media down some new avenues as well. The Age newspaper uses an example of transferring a high-definition movie from a kiosk at a store to your mobile phone in seconds. Then that same movie can be transferred just as quickly from the phone to your home computer or entertainment system to watch. 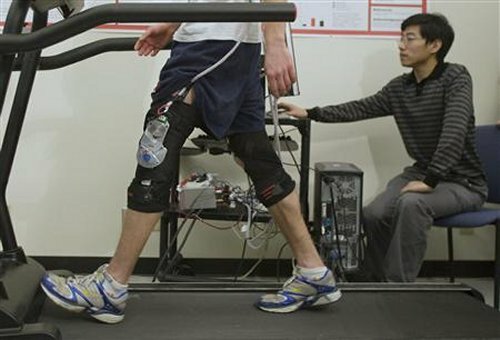 Some scientists from the U.S. and Canada have teamed up to create a new knee brace that generates electricity from your steps. The brace takes advantage of the stop energy that occurs after swinging the knee forward which would otherwise dissipate as heat, much like braking on an electric or hybrid car. According to the initial studies on the 3.5 pound prototype, a person walking at 2.2 mph was able to create around 5 watts of electricity while wearing a brace on each leg. The researchers state that this device can generate enough electricity to power as many as 10 cell phones, or possibly a small laptop. Some practical future applications include using the knee-mounted generator for campers or soldiers who are not near electricity to power up GPS devices or satellite phones. Anytime waterproofing is added to a gadget it just seems to make it that much more cool, but unfortunately not many electronic devices are able to live through being accidentally dropped into your Mai Tai or withstand a simple vodka resistance test because the the difficulty and expense of making small seals for all those cracks and crevices. Well, thanks to some scientists at the Defence Science and Technology Laboratory in Porton Down, Wilts. who originally developed the technology, gadgets may soon be getting something called an Ion-Mask coating to provide waterproofing to all sorts of devices. The Ion-Mask was a military technology originally designed to protect soldiers clothing from chemical attacks but soon could be used to protect mobile phones and media players from moisture, rain and the occasional drop in the drink. Some California residents might be receiving electricity from a more novel, environmentally friendly and source in the coming years. PG&E has announced that it is going to team up with Finavera Renewables to build a “wave farm” off the coast of California in order to generate electricity. 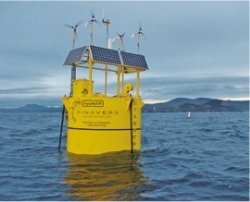 The wave farm consists of “wave energy converters”, or basically large buoys like Finavera’s Aquabuoy pictured here. As the buoy moves up and down on top of the waves that pass by it drives a piston which is anchored on the ocean floor. The piston creates pressure which drives a turbine and in turn creates electricity. A single full-scale Aquabuoy can generate 250 killowatts which can power approximately 80 homes. The initial plan is to create a farm of these buoys that will generate 2 megawatts of electricity by 2012, and if things go well they will ramp up the farm to produce 100 megawatts. This next story should give you pause to think about what may be ahead in the near future for the emerging biotechnology sector. A science team at South Korea’s Gyeongsang National University announced that they have successfully cloned kittens that have a modified gene that alters their skin color. When placed underneath an ultraviolet light a unmodified cat will look green. 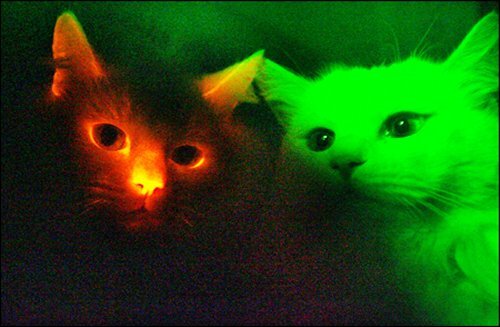 These new genetically modified cats have a fluorescent protein inserted into their DNA which makes their skin appear red under the same kind of UV light. Three cloned Turkish Angola kitties were born in early 2007 but one died shortly after. The two surviving cats now weigh 3.5 kilograms and appear to be perfectly healthy representatives of the feline race. Aside from being able to make funky colored critters the new procedure is hoped to be used for bringing back the populations of animals on the endangered species list as well as identifying and eliminating genetic diseases in people and pets. The Discovery Rainbow In My Room makes a great gift if you want to steer your kid toward Science and away from say, Halo. Though I doubt most boys would appreciate this. It fits in more in a room filled with My Little Pony’s. 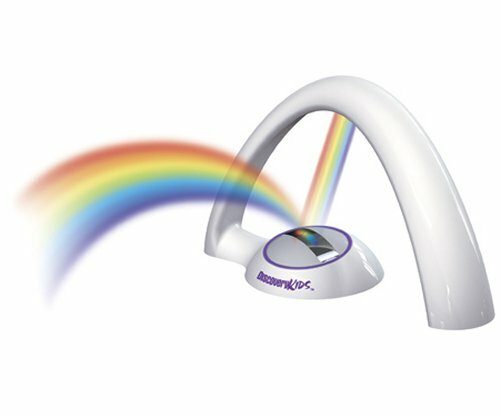 LED lights recreate the colors of a real rainbow and the motion-activated sensor turns the unit off with a wave of your hand. 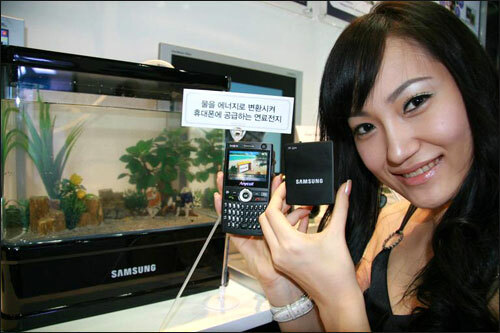 Samsung has actually developed a water powered cellphone. A micro fuel cell and hydrogen generator make it possible. They will be capable of powering all kinds of small electronics, in this case cellphones, for 10 hours on nothing but old fashioned H2O. 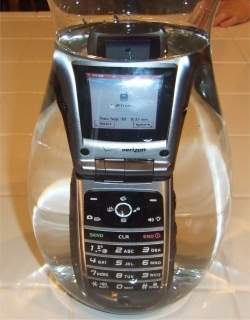 When the phone powers on, metal and water in the phone react and produce hydrogen gas. They envision beginning with hydrogen cartridges that would have to be changed roughly every four days, if you use the phone for four hours a day. After that, their plan is to improve on the design until all you need to do is squirt some water in your phone and you are ready. After 18 years spent playing the game and millions of matches won and lost, a computer has now solved the riddle of whether there can be a perfect game of checkers. 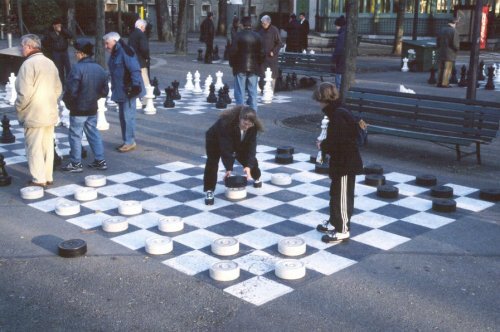 Computer scientists working at the University of Alberta in Canada used a program called Chinook to factor out the 500 billion positions possible in any one game of checkers. The result was that it is possible to reach a draw against your opponent but it’s exceedingly rare to happen. Chinook was able to plot out every possible move and reach the determination but for flesh and blood players, thinking ahead 20 or 30 moves down the line is asking a little too much from the software in our heads. 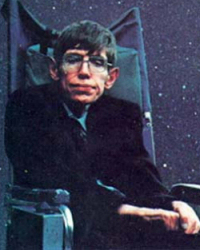 Stephen Hawking is a name that by now we all know well. The Cambridge professor, best selling author and the world’s reigning expert on black holes is now set to take a zero-gravity ride out of Cape Canaveral. Since he has spent most of his life working around the nature of gravity, it seems only fit that he should experience it himself, first hand. Said the executive of Zero G, “the idea of giving the world’s expert on gravity the opportunity to experience zero gravity” was irresistible. 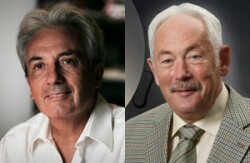 He will be accompanied by his own medical team to make sure that all is well with the genius. Are surgeons who regularly play video games better equipped to operate on you? A study by an Iowa State University psychologist indicates that Surgeons who play video games more are skilled and less likely to make mistakes than their non-playing counterparts. The study identifies a strong relationship between time spent playing video games and the surgeon’s capabilities performing laparoscopic surgery. 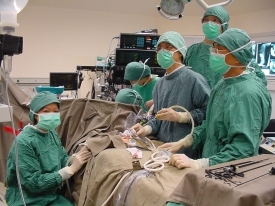 Laparoscopic surgery is a surgical technique where operations in the abdomen are performed through small incisions – normally less than 1.5 cm – as opposed to the larger incisions needed in traditional procedures. Scientists in Japan have discovered a method to grow teeth from single cells in lab dishes and transplant them into mice. The method involves the use of primitive cells that are injected into a collagen mold. The cells were taken from the tooth germ – a mass of tissue that has the potential of developing into a tooth. The cells eventually mature into a structure that shares the qualities of teeth, including dentin, enamel, dental pulp, blood vessels, and periodontal ligaments. Once transplanted to a mouse, the teeth grew and developed normally. This is a significant breakthrough in regenerative therapies and demonstrates the possibilities of developing bioengineered organs to replace organs failing from age, disease, or injury. The Ivory-billed Woodpecker has long been considered by bird-watching enthusiasts to be “The Holy Grail” of bird watching. The bird is an extremely rare member of the woodpecker family, and is officially listed as an endangered species and even considered extinct by many people. The Ivory-billed Woodpecker made headlines back in 2004 when a kayaker in Arkansas reported seeing one. In 2005 a team led by the Cornell Laboratory of Ornithology also reported spotting the elusive bird. In September 2006, a team of ornithologists from Auburn University and the University of Windsor also published a paper detailing evidence for the existence of Ivory-billed Woodpeckers in northwest Florida. In 2006, a $10,000 reward was offered for any information that leads researchers to an Ivory-bill nest. A company named EEStor is claiming that it is close to commercially manufacturing a battery that will last 10 times longer than standard electrochemical batteries. If fact the company’s goal is to completely replace standard batteries anywhere they are currently found from cell phones to cars. EEStor is claiming specifically that their new battery will store ten times more power and cost half as much as current lead-acid batteries. 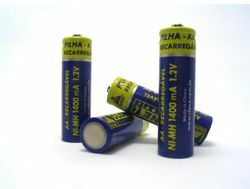 Lead-acid batteries are currently used in most automobiles. EEStor also claims it batteries will operate in conditions ranging from -4 below 0 to almost 150 degrees above zero. Not quite good enough for much of the northern United States in winter, but good enough for the southern parts of the country. We had such a great response to our post about ferrofluid a few months back that I thought I would share this video showing the effects of a gas that is six times more dense than ambient air. In the video after the jump a light boat made out of tin foil floats on top of sulfur hexafluoride contained in an aquarium, and the gas is actually able to be “scooped” like water to fill the boat and make it sink.